745 people have been infected and 58 have died from an outbreak of fungal meningitis associated with epidural steroid injections between september 2012 and June 2013 according to the Center for Disease Control and Prevention. The contamination was traced to more than 17,000 vials from three contaminated lots of preservative-free methylprednisolone acetate (MPA) packaged and marketed by the New England Compounding Center in Massachusetts. Doses from these lots were distributed to 75 medical facilities in 23 states, and administered to approximately 14,000 patients after May 21 and before September 24, 2012. A new report published in the September issue of The American Journal of Pathology, investigators from the Centers for Disease Control and Prevention (CDC) examines 40 cases including 16 fatalities. The report indicates that all except two fatal cases had a clinical diagnosis of meningitis. Tissue specimens from infected individuals showed inflammation of the leptomeninges and blood vessel walls within the brain. 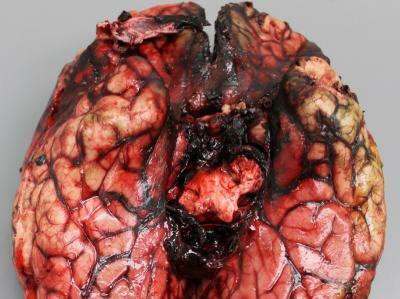 Autopsy examination showed extensive hemorrhage and necrosis around the base of the brain and clots involving the basilar arterial circulation.